Optimizing your website across multiple devices is only half the battle for users’ attention. The other half is correcting your SEO strategy for each version of your site. 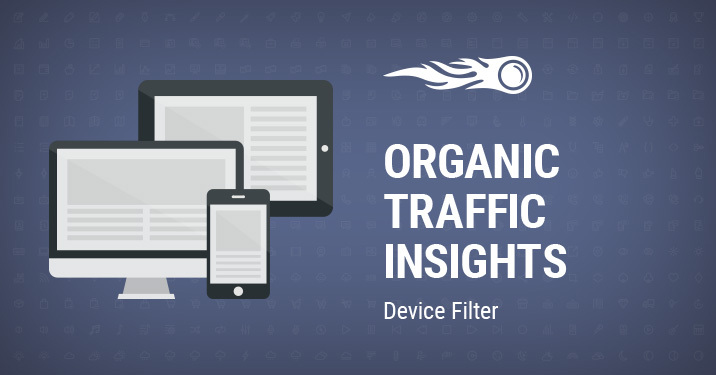 With the latest update, Organic Traffic Insights allows you to analyze the pages on your website that attract users from different devices and focus on keywords that actually drive traffic to them for each device. To benefit from this update, open your project for which you’ve set up Organic Traffic Insights, or create a new one and set up the tool. Click the ‘Device’ button at the top and select the device type. We will provide you with landing pages that users view from a particular device, depending on your choice. Important note: if you select ‘All devices,’ we will show you desktop data in the SEMrush section. Scroll down to the ‘Landing Pages’ report to see data from Google Analytics for the selected device. Click on the keyword number for a page you’d like to research. Switch between SEMrush and Google Search Console to get a full picture of the keywords that are driving traffic from the device you’ve selected. And for the cherry on top — we’ve integrated all the mobile databases we currently have into the updated tool. Tip: Need more data for multiple devices and more frequent updates? Don’t forget to connect your Google Search Console account. What do you think about this update? Should you have any feedback or ideas on how to improve the tool, do not hesitate to get in touch with us via [email protected]. Stay tuned, as more updates are coming!